Gripping and packed with shocking twists and turns, this intense psychological thriller plays with a basic anxiety we all harbour: What if one reckless decision could ruin your life forever? I wasn't sure that I was going to like Too Far from the opening pages, as the world of real estate is not something that interests me, but I'm so pleased that it didn't put me off as there's an absolutely gripping story to discover within the pages of this thrilling book. I absolutely raced through it and, although I had some suspicions, I loved the way the story played out. The writing is so visual that I wouldn't be surprised to see this story on our tv screens at some point. I actually really liked the character of Jack; I felt as if he was just going through the motions of life. Doing a job in real estate that he hates and with a marriage that is barely holding together, I don't know how he managed to stay sober. When he meets up with an old friend whose life seems illicit and exciting, Jack doesn't see the harm in logging on to an website for married people to hook up. He doesn't plan to register but when he gets a message from a woman who seems to be made for him, he can't resist. The moment he inputs his credit card details, wheels are set in motion that could see him lose everything he ever held dear and there's nothing as dangerous as a man who has nothing left to lose. I'm sure many of us have dabbled in online dating (for singles though, not married people), there really is nothing as exciting as making that connection with someone who feels just right for you. Then you hear the horror stories of catfishing, where people pretend to be somebody they're not, and you wonder if the person you are connecting with really is too good to be true. 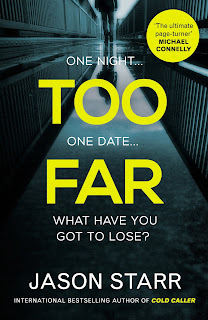 It's a real minefield, as Jack found out in this book, and I really loved the way the author showed the two sides of the online dating coin. 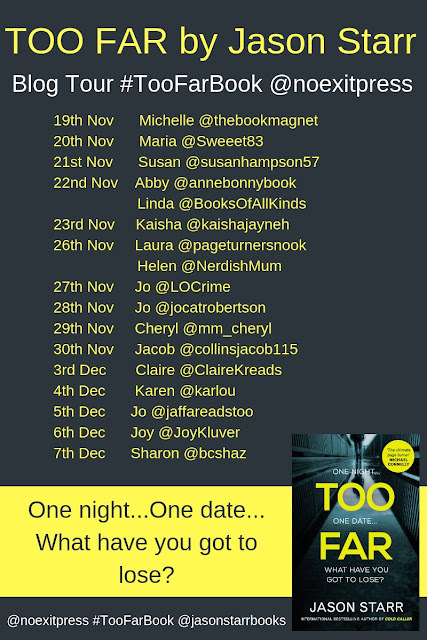 Too Far is a very current thriller in this day and age of online dating; it's a gripping, fast-paced page-turner that I thoroughly enjoyed. Jason Starr is the international bestselling author of many crime novels and thrillers and his books have been published in over a dozen languages. Many of his books are in development for film and TV. Starr's bestselling crime novels include Cold Caller, Nothing Personal, Fake ID, Hard Feelings, Tough Luck and Twisted City, followed by Lights Out, The Follower, Panic Attack, Savage Lane and his latest novel, Too Far. He is one of only a handful of authors who have won the Anthony Award for mystery fiction multiple times. He was born in Brooklyn and lives in Manhattan.